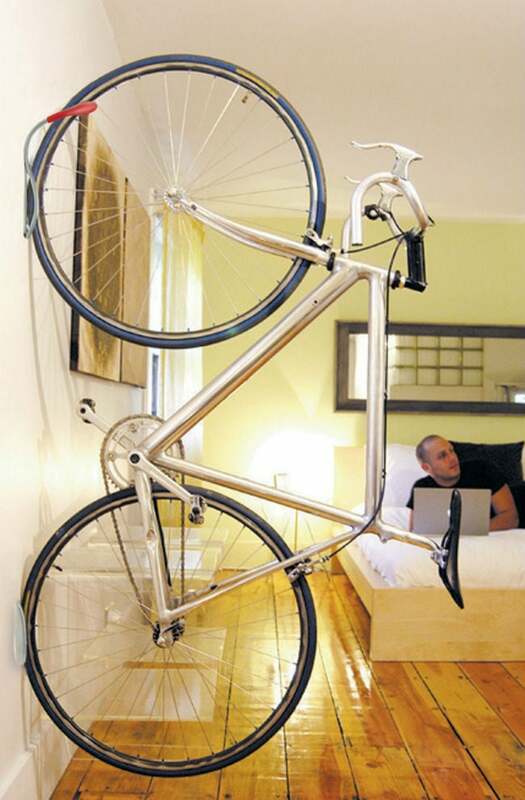 When you’re not burning the rubber, store your bike high and dry on an interior wall with one of four easy-to-install bicycle mounts on the market today. For all of the benefits that come with regularly hitting the road on a bicycle (from a reduced carbon footprint to fewer gas station trips) these foot-powered vehicles can pose a problem when it comes to parking it back at home. Because bikes leaned against home exteriors beg to be stolen, and cycles chained to outdoor bike racks can fade and rust, walls within the home interior remain one of the safest and most convenient shelters for off-duty bikes—provided that you have the right mounting hardware and know how to install it to securely store your bike. Ahead, we share four ways to wall mount bikes using the best systems on the market today. 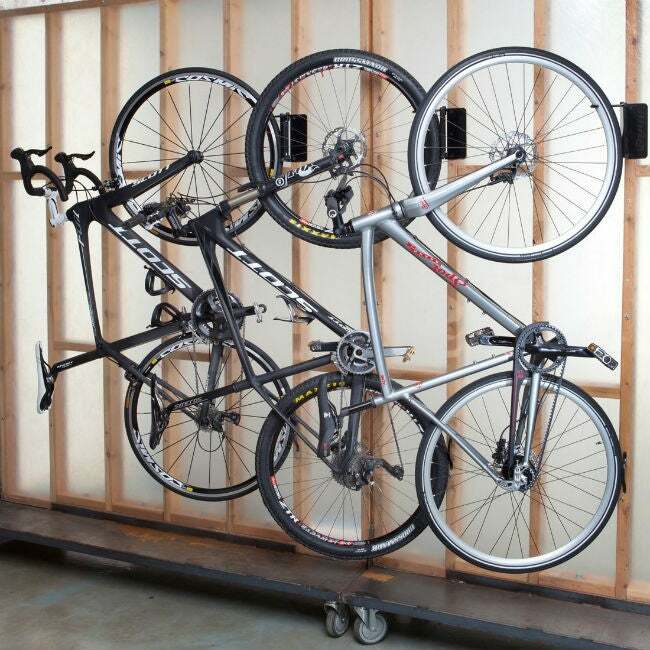 With any of these top-rated wall-mount bike racks, storing your bicycle on the wall can be even easier than learning to ride it in the first place! Keep reading to figure out which mighty mount is best for your needs and how to install it. Need to park your bike in a narrow space such as a room or garage corner, behind a door, or in a shed? Vertically hanging it from its front tire via a wall-mounted hook is your best option due to the negligible horizontal wall space that’s taken up by hooks. Rated 4.3 out of 5 stars by Amazon reviewers, this handy hook-and-tray storage system features a scratch-resistant red rubber sleeve around the front wheel hook and a rear wheel tray that mounts below to catch the back wheel of the bicycle (and stave off tire tread marks on the wall). 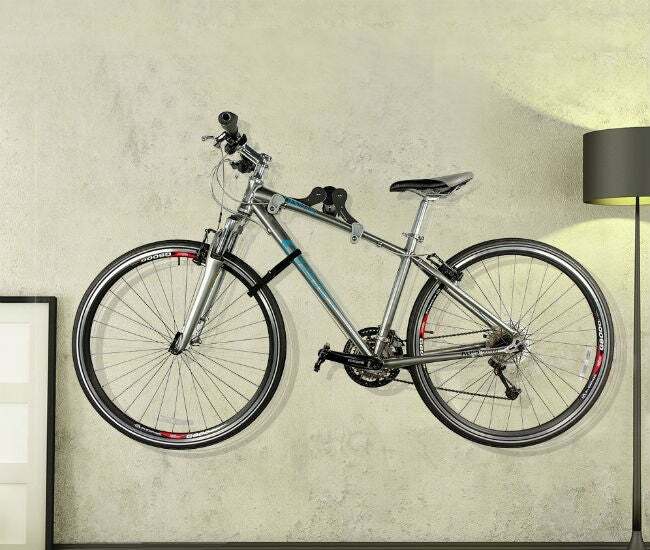 Together, the silver powder-coated set trumps conventional bicycle hooks in looks, durability, and wall protection. To install this wall-mounted bike rack, use a stud finder to locate a wall stud where you’ll mount; position the front wheel hook/mount here and mark the locations of its two holes in pencil. Next, drill these holes with a power drill and secure the mount to the wall with the included screws. Go ahead and rest the front tire between the two grips of the front wheel mount, ensuring that the hook wraps around the front tire. While it hangs in place, peel the adhesive backing from the rear wheel tray and adhere the tray low enough on the wall to make contact with the back wheel—it should hold this bike tire between the tray’s grips. Voilà! The Da Vinci Hook supports bikes weighing up to 40 pounds and with tire widths up to 2.5 inches, so road and mountain bikes alike can safely be stored aloft. Have a bevy of bikes? 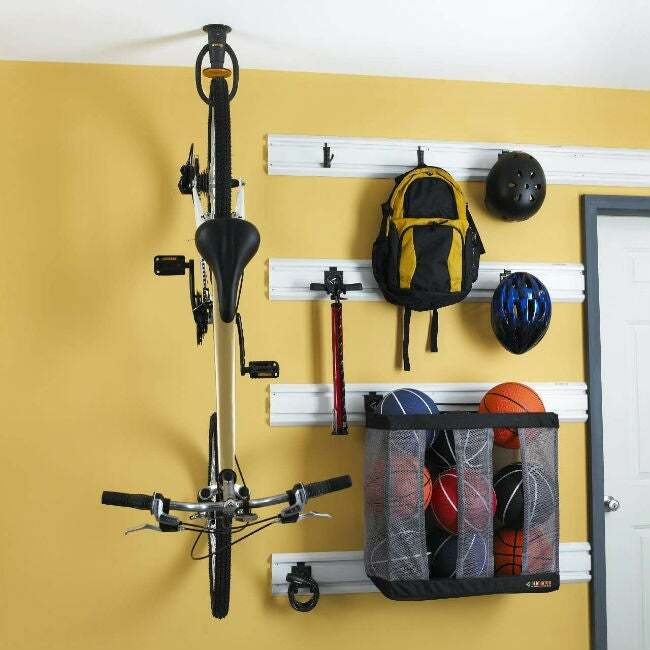 Install several hooks horizontally and then hang up the bikes side-by-side to put your sporty side on display. Available on Amazon for $13.67. If you’re seeking a storage option that stows bikes flat against the wall to save space or accommodate surges of foot traffic in your garage or mudroom, consider hinged mounts that pivot back and forth. The Velo Hinge allows you to angle your bike closer to or farther from the wall as needed. Rated 4.2 out of 5 stars on Amazon, this bike mount boasts a front wheel hook that completely folds away when not in use, a hinged mount that pivots 45 degrees left or right, and a back wheel bumper for stability. As with any of these ways to wall mount bikes, first, find your wall stud. Then, get started with installation by separating the two-flapped hinge mount and positioning the right flap of the mount over the wall stud (have its screw holes on the right side if you want the bike to fold to the left and on the left if you’d like the bike to fold right). Pencil in the location of its three holes, pre-drill, and secure the mount to the wall with screws. Finally, reassemble the Velo Hinge in place on the wall and thread the hook through the top of the hinged plate. When you’re ready to mount your bike (be that a standard road, mountain, or children’s bike up to 50 lbs), press the hinged plate to pop it open and swivel the hook over the top so that it extends out perpendicular to the wall. Now you have a place to hang a spoked front wheel! With the bike hanging, screw the curved back wheel bumper to the wall below so that the bike’s back wheel rests against its edge. And, when the bike is down and the wall mount is not in use, simply swivel the hook back inside the two plates to hide it. Available on Amazon for $24.70. Bike racks that allow you to hoist your cycle in parallel with the wall tend to take up more horizontal wall space and, therefore, fit fewer bicycles on the wall than hooks. Still, they can do the job for cycling-happy singles, couples, or small households with just a few vehicles in need of storage—and they’ll do it with flair. 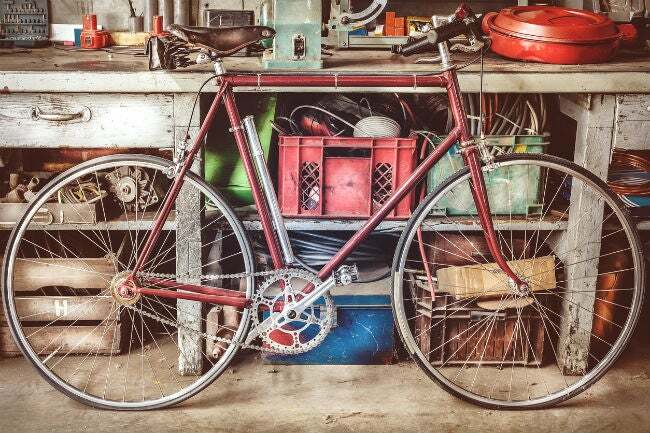 A bike raised from the floor in a mudroom can look like some sculptural art! To make the most of the wall space taken up by one of these mounts, opt for an ultra-adjustable model such as the Ibera Horizontal Bike Wall Hanger. This 4.3-star aluminum mount features a hanger beam that extends from the wall or contracts to fit the various widths of bikes’ handlebar as well as a frame holder with two arms that can be lifted or lowered to all sizes of bike frames. This means you can easily swap out a smaller road bicycle for a larger mountain bike or vice versa (as long as it doesn’t surpass the weight limit of 39.7 lbs) without installing a whole new wall-mount bike rack. This mount goes in over a concrete or masonry wall using anchors and plasterboard or drywall if drilling directly into wall studs. Position the wall-mounted bike rack so that the wheels of the bike are horizontal and raised at least four inches off the ground, then mark and drill holes in the wall correlating to the screw holes in the mount. Then, fasten the base of the bike mount to the wall (in studs or using anchors) with screws and slide the two-armed portion of the bike mount into it until the length of the beam is roughly the width of one of the bicycle’s handlebars. Use the included Allen key screw the bolts, pull down the two arms and lock them in place, then rest the bicycle frame over them. Finally, when hanging up your bike, be sure to wrap the included Velcro wheel anchor strap around the bottom of your frame and through the front wheel of the bike to keep the bike from swaying back and forth. Can’t spare an inch of wall space for your roadster? Choosing a ceiling-mounted bike rack allows you to tap into the hidden storage potential of the ceiling. Made of heavy-duty plastic, the 50-pound-capacity Gladiator Claw keeps everything from two-wheelers for tykes to rugged mountain bikes off the floor, off the wall, and safely suspended in the air. The cleverly engineered claw that opens and tightly shuts around the rear wheel of your bike via a convenient push-and-lock mechanism. Heck, if you install two spaced the length of the bicycle’s frame, you can hang your recreational vehicle by both wheels so that it’s completely out of the way. You’re not completely locked into overhead storage, though: Should you decide later on to move your bike from the ceiling to the wall, there’s an add-on sold separately for this storage mechanism that lets you install the claw on the rail of a Gladiator Wall System (available on Amazon). Installation of the claw is as simple as securing the base of the mount to a wooden ceiling joist with the included screws. Simply touch the back tire of the bicycle up against the central yellow button to close the claw arms around it. Lift the rear tire against the yellow button again to reopen the claw arms, pull down your bike, and hit the trail. Available on Amazon for $17.98.